HARARE – Six Zanu PF youth officials were on Monday jailed for a combined 32 years after they were convicted for torching a ZUPCO bus and ransacking a supermarket owned by Chegutu East MP Webster Shamu during fuel price protests on January 14. Thirty-five-year-old Benson Bhobho, the Zanu PF youth league chairperson for ward 40 in Whitecliff together with members of his executive Charles Bengeza, 28, Shylock Chihuri, 25, Emmanuel Chari, 25, Miston Siriva, Cassim Muzhingi, 23, Noleen, 29, and Rumbidzai Dulana, 25, all denied charges of public violence. Regional magistrate Elijah Makomo acquitted Bhobho and Muzhingi for lack of evidence, but found the other six guilty. 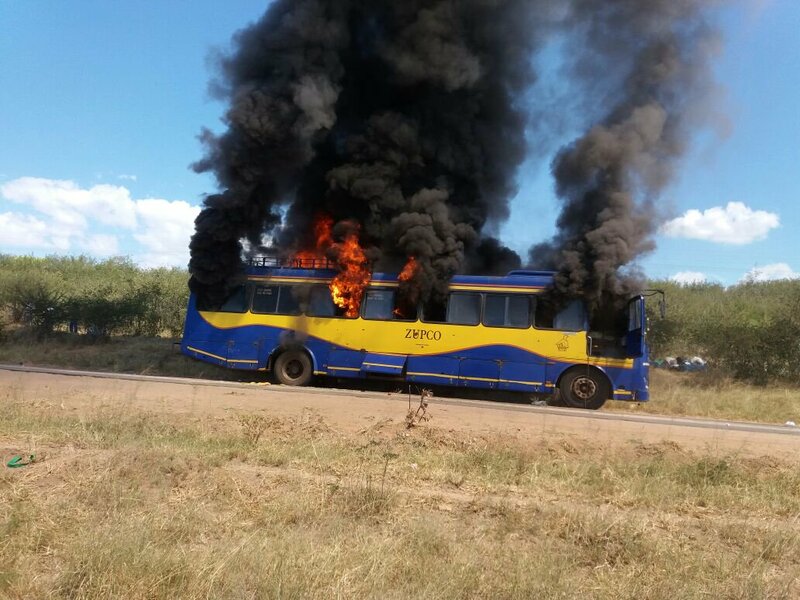 Chari, who briefly drove the ZUPCO bus which the group commandeered along the Harare-Bulawayo highway before setting fire to it, was jailed for seven years while his co-conspirators were each jailed for five years. The Zimbabwe government blames the MDC for instigating violent protests and looting on the first of three days of a stay-at-home protest called by the Zimbabwe Congress of Trade Unions, but evidence has emerged that in instances, agent provocateurs were either military personnel or Zanu PF youths. The court heard how the group, with others still at large, barricaded the Harare-Bulawayo highway with boulders close to Shamu’s Whitehouse Shopping Centre on January 14. They also threw stones at passing cars. The six – part of a group numbering about 2,000 according to prosecutors – stopped a ZUPCO bus heading into Harare and ordered its passengers and crew to disembark. Chari, the prosecution proved, then drove the bus a further 40 meters up the road where it was set alight. The six, acting in connivance with others still at large, proceeded to a PUMA service station operated by Shamu where they ordered staff on duty to leave. They broke the doors and windows to Webcon Supermarket at the service station and looted the shop clean before setting a Mitsubishi van in the car park ablaze. Police recovered some of the looted items from the homes of some of the six. Michael Reza prosecuted supported by George Manokore and Charles Muchemwa.